For the nonce, I’ve ended this swatch. Though I’ve left the top live stitches on a thread holder just in case. I also have the stitches from the knitted cast on at the bottom that I could pick up if I wanted to add on. I can even pick up stitches at either side, too. The edging I experimented with is a pick up add on. I am not enamored with the edging itself or the way it looks when picked up along a side border. The Brand Iron edging should start nearer the middle of the border and not at the corner. It would look better that way. But at that point I was almost certain I would not be working the shawl / blanket from the center out as planned. So there was little need to see what I had to do to fit the edging around the corner. The fact is I am not in love with much in the swatch except for the cat’s paw motif near the top bordered by two different break patterns. While I like two of the diamond shapes of what was to be the border, I am not happy with the others. I want to add a tree of life pattern into the border and keep the two diamond patterns I like. Adding the tree of life changes pretty much everything. It’s a directional pattern, meaning it has a distinct top and bottom. It would be upside down if I worked the shawl from the center out. Thus, I had to change my construction process to borders in, meaning the edging is knitted first, then the border and then the center. The swatching is on hold, for the most part while I work out what motifs to put with the tree of life and the two diamonds and figure out an edging. As always, my assistant, Yarn Rascal, is close at hand and ready to destroy help. Close inspection of knitted work is a must, in his profession. The closer the better. The weekend was restful even with Yarn Rascal in full Yarn Rascal mode. Autumn in this area of the world has decided to wear pastel colors this year. Leaves the color of fire’s flame so bright you’d think the hills were burning are not with us this year. Intensity gives way to toned down color and only comes to life with the sun shining behind. Though the Japanese Maples seem to remember what Autumn once looked like. 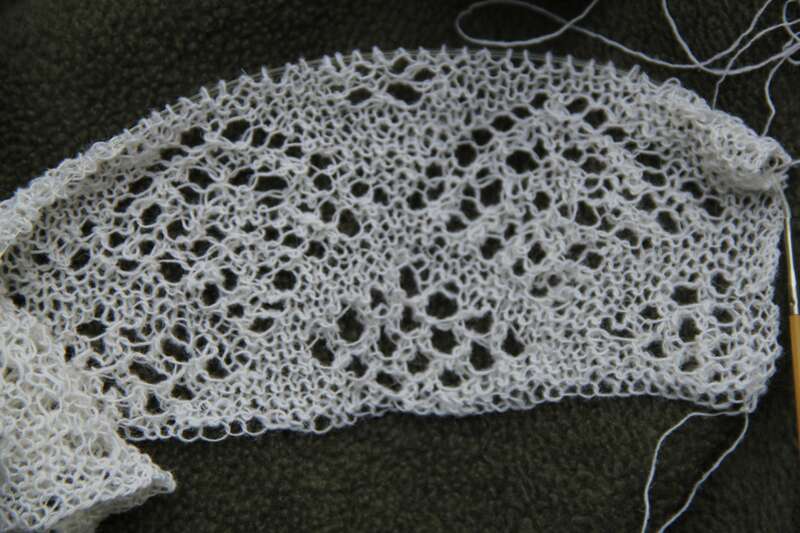 The Shetland Lace Swatch grows. Like watching grass lengthen, isn’t it? The pink yarn is the life line. I am sure that the bottom pattern will be the large border even though I have only knitted 85 rows of the 135 plus that make up that border. Above the life line I am sampling break patterns, fill-ins, elements for smaller borders, and patterns for the center. When I am done with what I am now looking at as a sampler, I will pick-up stitches along the edges and try out various edgings to see what I like. I am really enjoying the swatching process. I would never have thought I’d say that. I’d like to include the Cat’s Paw and/or the Rosebud motif somewhere in the shawl. If I do, then I need to also include some eyelet motifs elsewhere to balance things. I am also leaning toward small trees and/or ferns designed to echo the diamond pattern so prevalent in the large border. The problem with trees and ferns is that they are directional. They have distinct tops and bottoms. If I include them, I will have to rethink my borders out design and look to the traditional way of putting the shawl together: sewing / grafting it all together. But let me not panic now. It’s too early in the design process to run around with my hair on fire. Good news! The Skipper is wood working again. He is spending time in his two man caves: the basement and garage. 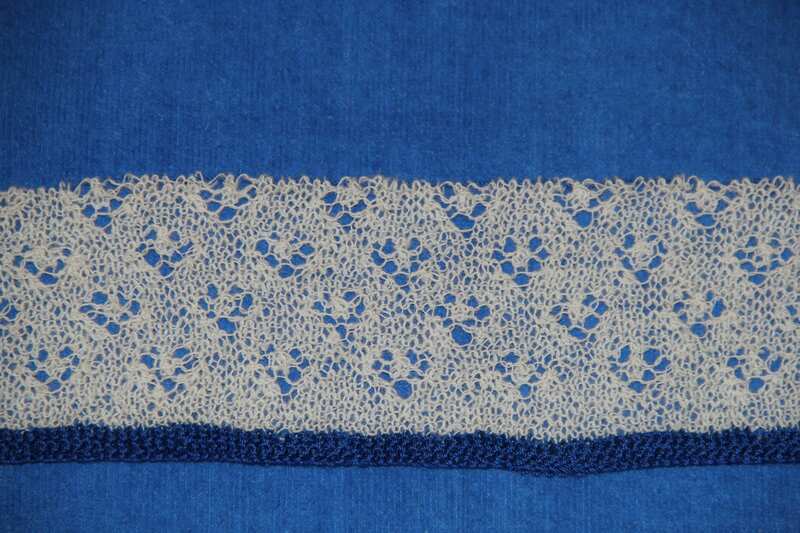 I, on the other hand, have ordered the final book I wanted on Shetland Lace called A Legacy of Shetland Lace. I could just squeal with delight! The last bit of info I want to share happened to me Friday and I want to pass it along to other women who might be going through or know women who are going through breast cancer stuff. I went to the dentist on Friday. It seems that when a woman receives breast cancer treatment one of the things that takes a negative hit is saliva. That’s right, the much under rated, never thought about, spit in our mouths. Saliva is crucial to teeth and gum health. It provides much needed calcium and other enzymes that teeth and gums need to counteract the bacteria, plaque, etc. Cancer treatment significantly reduces the amount of saliva produced and wipes clean what little is left of the calcium and enzymes needed to maintain dental health. Say hello to root canal work. The R and C words when put together are in the top 5 of the least favorite words I want to hear. If you are going through breast cancer, see your dentist and start an oral hygiene routine that will help women like us avoid expensive dentistry while keeping our mouth and teeth healthy. 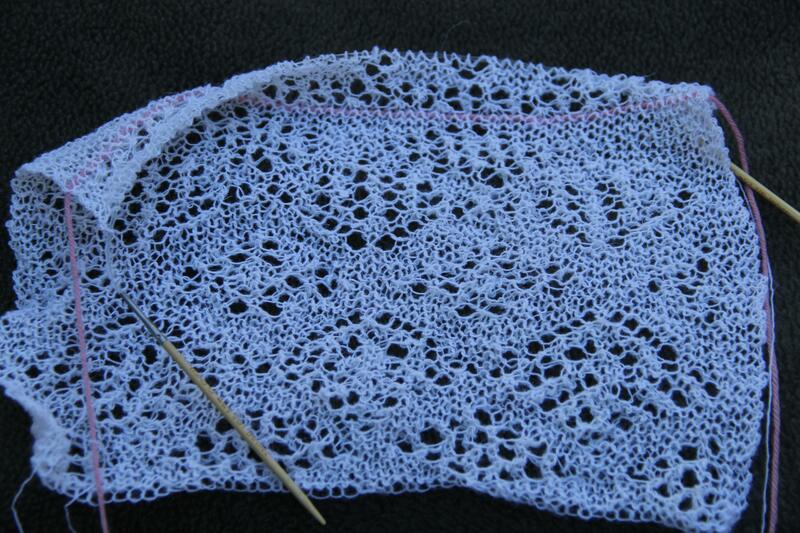 The Shetland Lace Shawl swatch continues to grow. It’s at 61 rows now, with 20 more to go. Reading the chart seems less daunting than when I started. The patterns make more sense to me. The knitting itself more rhythmic. I am no longer taking in a breath at the beginning of the row, holding it, and finally letting it go at the end of the row. Breathing normally while knitting makes for a better experience. One would think that something made from so fine a yarn and full of lace holes would be long on good looks but not warmth. Not true. The amount of warmth this piece provides is well beyond what I thought. Any item made from this yarn will provide toasty warmth. 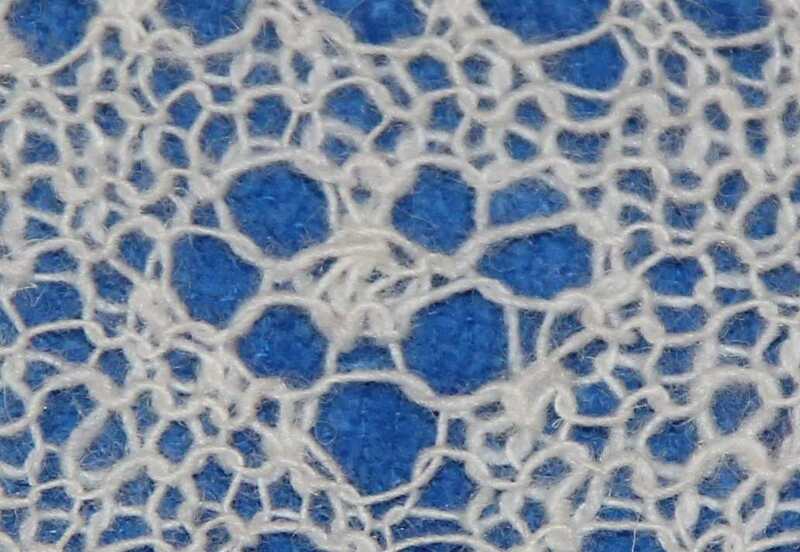 No wonder the Shetlanders used this fine wool for socks, undergarments, shawls and the like. 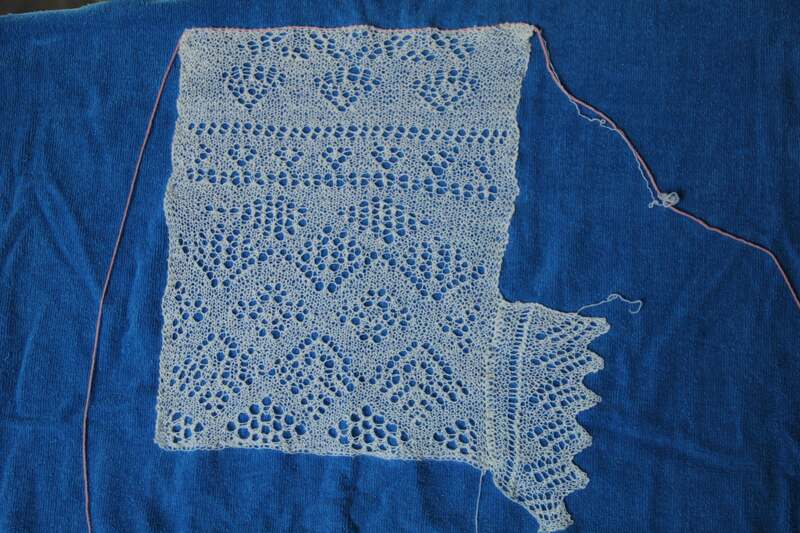 I am hunting down 2 more Shetland Lace books. One is out of print, but I bet I can find it on Amazon anyway. The books will have to be acquired through the mail, which means I can’t just slip them quietly into the bookshelf and not have The Skipper notice them. I can sense that one way ticket coming. I keep nudging him towards his woodworking downstairs and in the garage areas so he is out of my hair. That’s where he needs to be, wrapped up in a project, for me to ease the books into their rightful place, which is my eager hands. The next blow for The Skipper will come when I rip out a good part of what I am now knitting to figure out yardage. Whenever I rip back some or all of what I have knitted, it is like nails on a chalk board for him. 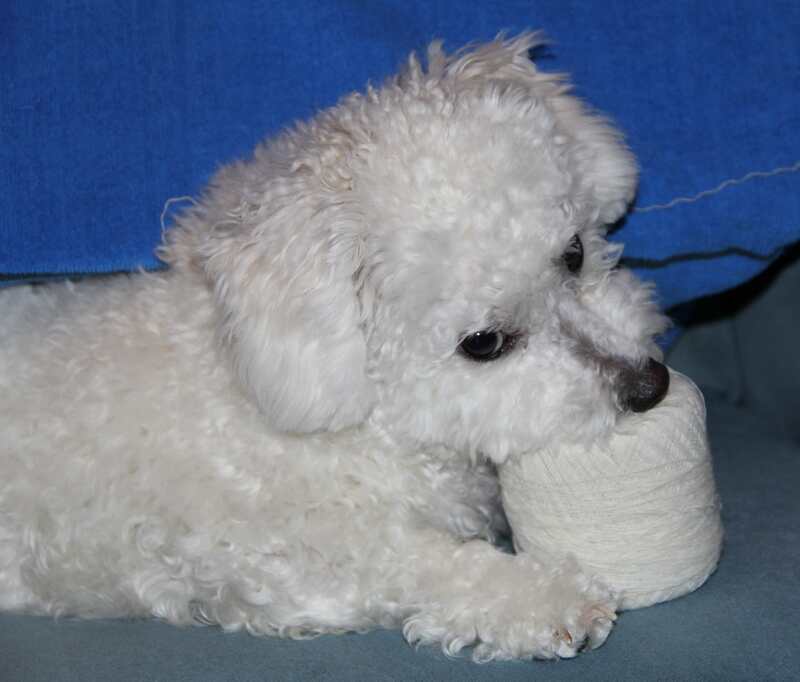 Though I explain it is a natural part of knitting it still annoys him. I am hoping for a quiet weekend. A weekend of rest. I haven’t had one of those in a long time. The swatch for the Shetland Baby Shawl continues. 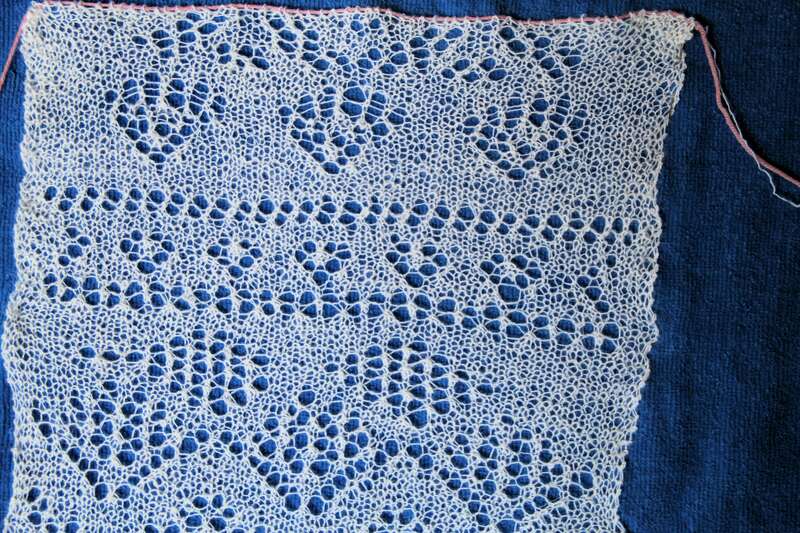 It’s 60 stitches long and 41 rows. I don’t know what it will block out to and I am looking forward to finding out. 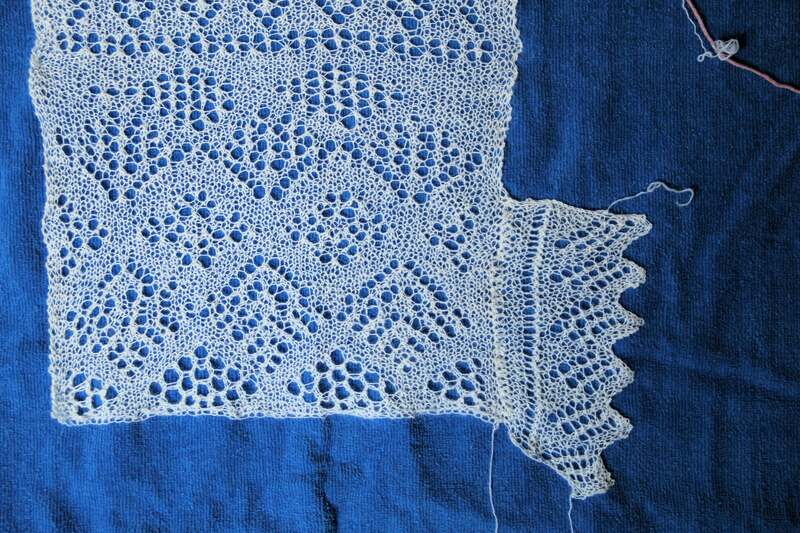 The motifs shown may make up the wide border of the shawl. I am kind of sold on the diamond at the very bottom, but am not sure about some of the other shapes. I don’t know what the gauge is yet. I’ll take that measurement after it is blocked or rather dressed. I am going to test out an edging at the top after I finish the entire border motif. 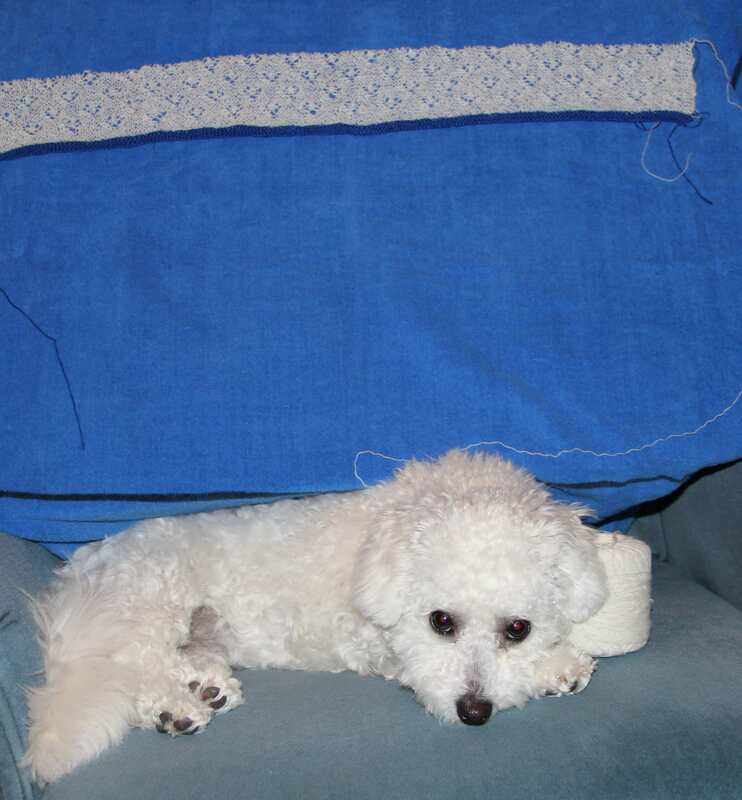 Should I keep this particular border I may change the spacing of the motifs. Right now I am planning on working the shawl “borders out” which means making the center first, adding break patterns and smaller borders with more break patterns, then comes the border pattern I am swatching. More break patterns then the edging. Picking and choosing the designs is exciting. Every element that goes into this shawl will be swatched first to make sure it works as a cohesive whole and that I can knit the motif without constantly messing it up. 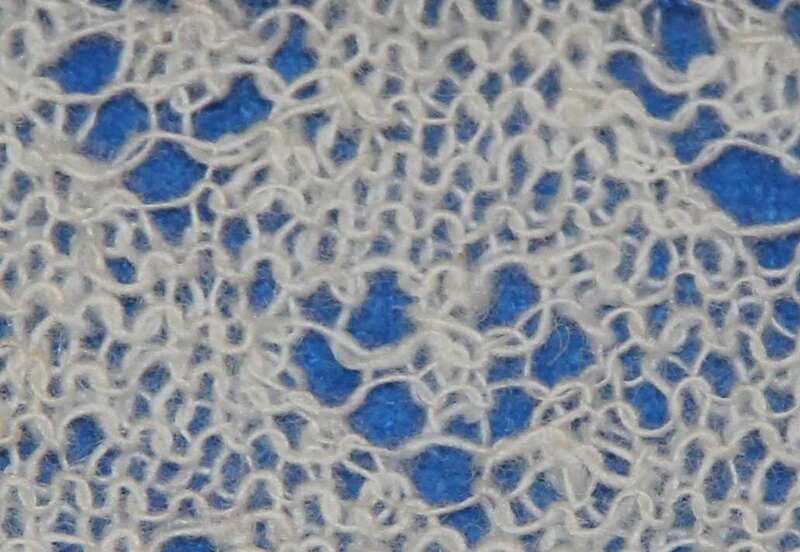 Right now the swatch looks exactly like I envisioned it: frothy like the foam left by a wave as it retreats from shore. I hope the needle size continues to give me that effect after dressing. 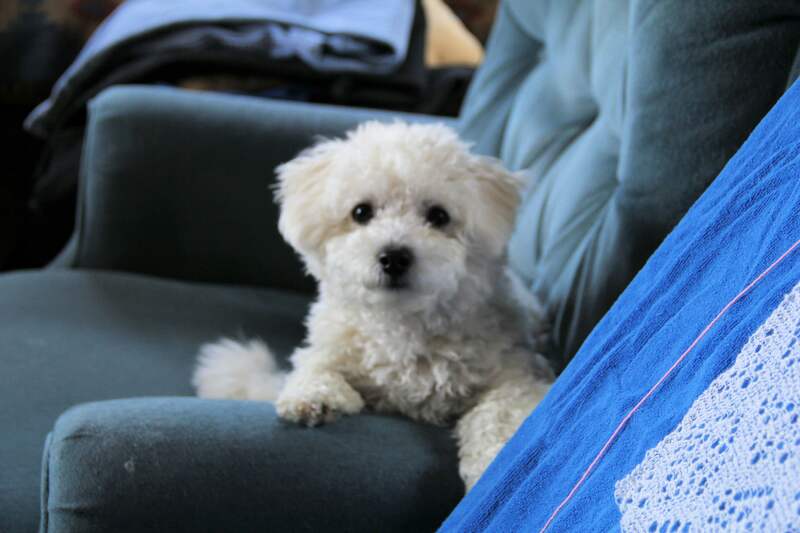 On the camera front, I got the Canon EOS60D and I am loving it. All bad shots are my fault from here on in and not the camera. It’s not small nor is it light weight but I still love it. 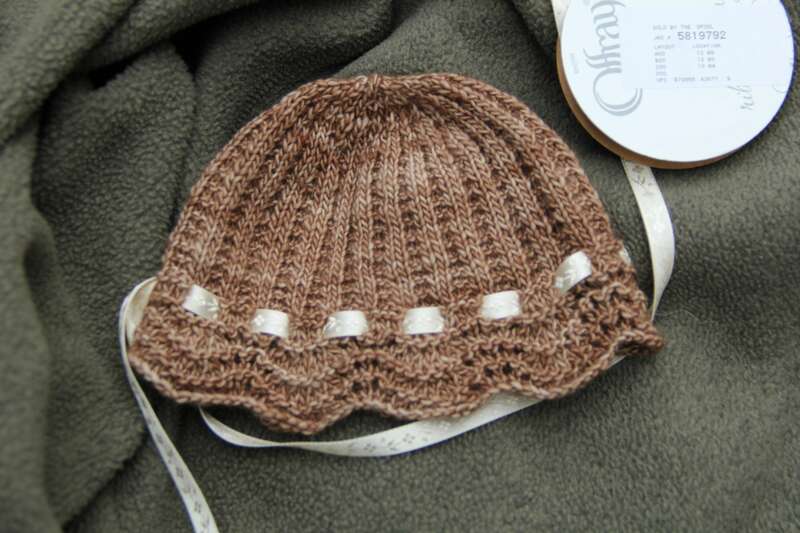 The Charlotte Baby Sweater and Hat are almost ready to be sent to the test knitters. Monday I traveled to the not-so-local Joann Fabric Store and found the perfect ribbon to finish the hat and sweater. I all but squealed when I saw it. 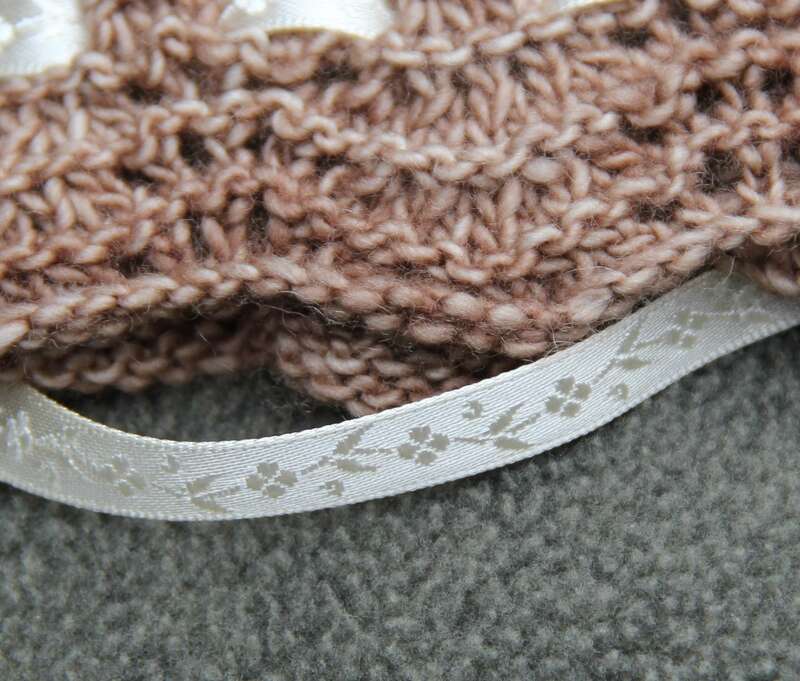 Tie the ribbon in a bow, sew on the sweater’s antique buttons, which go perfectly with the ribbon, take some photographs of it all and off to the test knitters. The word from my oncologist is good. Stay of execution granted. I am very grateful for all I have and don’t have. I spent the weekend knitting and ripping out swatches for the Shetland Lace Baby Shawl I am planning. I learned some good lessons. 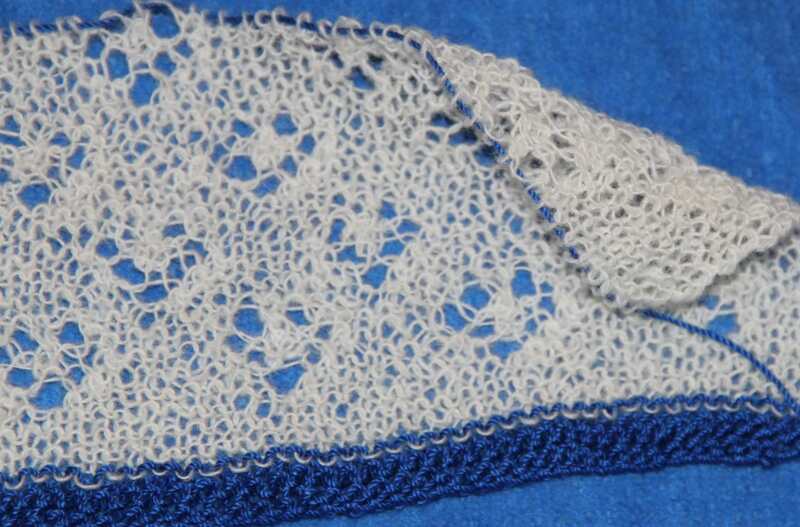 Shetland Lace is not something I can knit quickly, which is okay because I am not a fast knitter. I am more of a process knitter than a project knitter. Being a process knitter is a good thing when taking on a large project like a 54 inch Shetland Shawl because there is a whole lot of process knitting to be done. Never announce that I need not to be disturbed for the next hour. It tempts fate. And in my case, fate always wins. Before I try to knit a row densely filled with symbols for yarn overs, left and right slanting decreases, more yarn overs, a central decrease, double yarn overs, and a star symbol that I don’t know what it means, re-read the section on Chart Symbols, before—and that’s the most important word here, before I start the 60 stitch row. When I lose my place in the middle of a 60 stitch row know that it means I really have lost my place and must go back to the beginning of the row every time. Do not wonder what I am going to do when the rows are 300 to 400 stitches long. Assure myself that by then I will know what I am doing. Marvel at the fact that I am screwing up a pattern that is clearly charted and staring me in the face, while the Shetland women who made these wonderful shawls most often worked the patterns from memory. Entire shawls and stoles, worked from memory. I could just weep.